I hope for a download link to the new MOSAIC.WAV album for Christmas. I have nothing I use daily aside from my computer, my camera, and my bike. My PC needs no stickers, but it'd be nice to have a cute sticker for my helmet and something cute on my keychain. For instance, if these character drawings were stickers they'd be perfect. I haven't noticed much activity from that MOSAIC.WAV torrent I uploaded for the last thread so I'm going to stop seeing to keep my torrent client looking tidy. 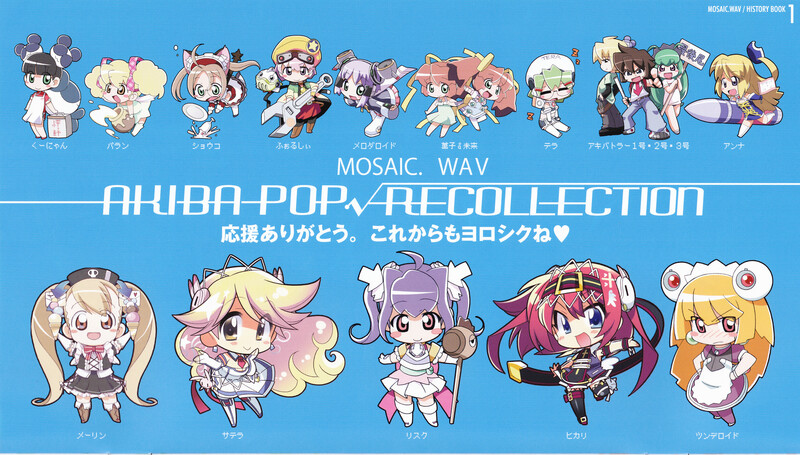 AKIBA-POP √ RECOLLECTION contains songs spanning most of their career and also contains some new songs. I didn't even know all these characters were named. Which one's your favorite? I've always been partial to Melin, but I never realized how cute Tsunderoid is.